How Much Water Do I Need to Drink to Lose Weight? You might think that exercising and sweating would easily help you lose water, but the truth is that exercise can contribute to water retention. Water retention can be related to changes in your body’s levels of sodium, a key mineral in the regulation of fluid levels in the body. Too little sodium can cause the body to react by retaining fluids, while too little water can trigger the same response. Hyponatremia occurs when the sodium levels in your blood drop to dangerously low levels and you start to retain water and other fluids throughout your body. 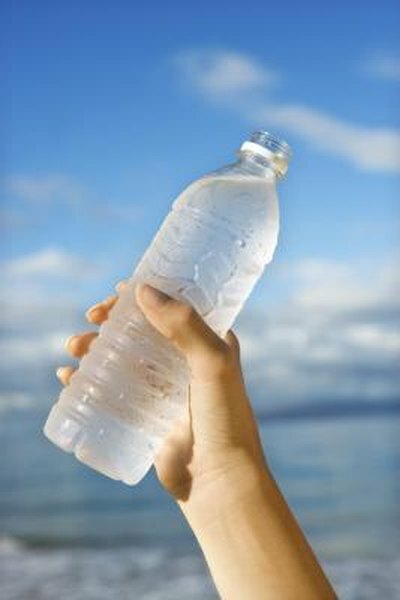 One of the triggers of hyponatremia is excessive consumption of water during exercise, MayoClinic.com warns. Sodium, which helps regulate the body's fluid levels, can become diluted if you drink too much water. With sodium leaving the body in sweat, excessive water consumption can lead to greater water retention and possibly hyponatremia. MayoClinic.com recommends you consume no more than 34 ounces of water for every hour of physical activity. Not having enough water during exercise can also lead to water retention, though it's not same as hyponatremia. If you maintain a healthy consumption of water, and assuming your sodium levels are healthy, your body can achieve a fluid balance. But if you don't drink enough water, particularly during exercise, your body responds by trying retain as much fluid as it can to continue functioning. Exercising in the heat, without replacing water, sodium, potassium and other electrolytes, can contribute to another form of hyponatremia, called hypovolemic hyponatremia. It's the result of low sodium and low water levels, MayoClinic.com explains. During moderate physical activity you can typically drink just water, but during more intense activity, particularly in the heat where you will be sweating more than usual, you should replenish your fluids with a sports drink that has sodium and electrolytes that can help balance your mineral and fluid levels. Exercise itself doesn't lead to water retention. Instead, it's whether you maintain a healthy level of hydration during your workout that can contribute to water retention. Certain medical conditions and medications also can contribute to water retention. For example, thiazide diuretics, prescribed for high blood pressure, can cause water retention, MayoClinic.com warns. If you are starting to feel that you're retaining water and adjusting your water intake during exercise isn't having an effect, consult your doctor.